The main branch of the Law Library of Victoria is located within the Supreme Court of Victoria, in the heart of Melbourne's legal district. A stunning building of historical and architectural significance, the library is open for members of the public and the legal profession alike. Members of the public are encouraged to explore our building and collection, but are reminded that the Law Library is also a working library for those conducting serious legal research. Find out what's happening at the Law Library and register for one of our upcoming events. Our librarians conduct regular tours of our building and collection. Special history and heritage tours and annual events are also detailed here. 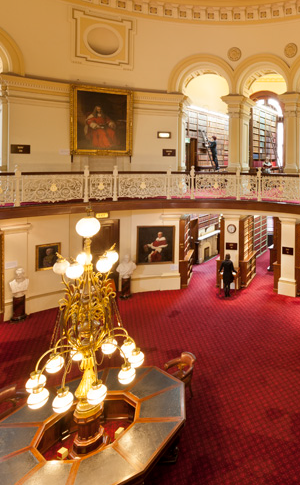 Law Library of Victoria opening hours and location, as well as other important information for visitors. Floor plans, general guides and detailed information on locating items in the Supreme Court Library collection.